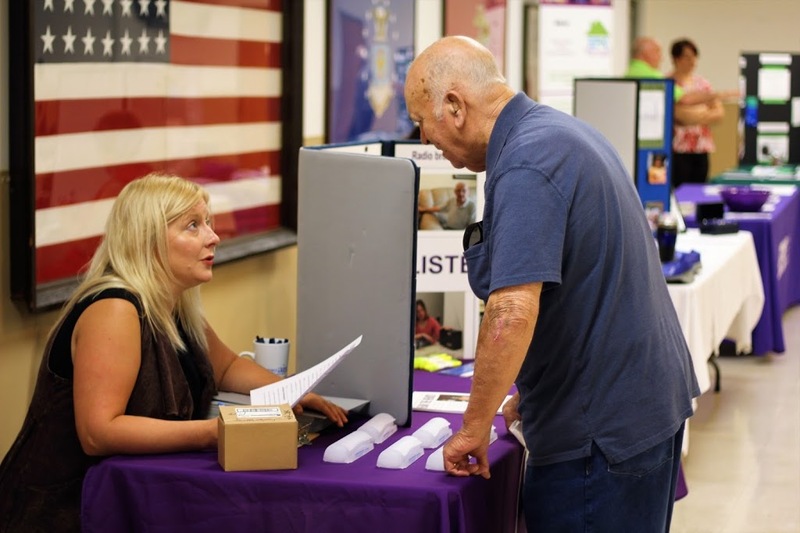 “I am very impressed with what I’ve seen here today,” pronounced Joe Kendall, a Veteran and farmer from Galva and attendee at the Veterans’ Health Fair in Galesburg on Wednesday, August 30. Joe and his wife, Geri, left the event with both helpful information and an array of brochures and information describing services available to Veterans and Seniors in the region. This was among the many positive attendee reactions for the second of three Veterans’ Health Fairs that Rep. Dan Swanson (R-Alpha) put on for Mercer, Knox, and Bureau Counties beginning on Tuesday. Knox County’s event was hosted at the Galesburg American Legion Post 285 on East North Street. Dozens of attendees joined dozens of exhibitors representing state, local, and community agencies in providing information to Veterans and seniors in attendance. Big Catz BBQ of Knoxville hosted a lunch of pulled pork sandwiches and baked beans at the Galesburg event. Taking great constituent service on the road, Rep. Swanson also hosted Veterans’ Resources Fairs in Aledo on Tuesday, August 29th and in Princeton on Thursday, August 31st.